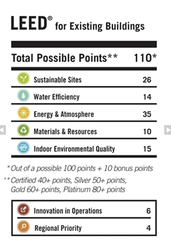 LEED was developed by the USGBC (United States Green Building Council) to provide a third party verification that a building was designed and built aiming to improve performance in energy saving, water efficiency, C02 emission reduction, and the quality of an indoor environment. Since 1998 the USGBC has grown to encompass more than 14,000 projects in the U.S. 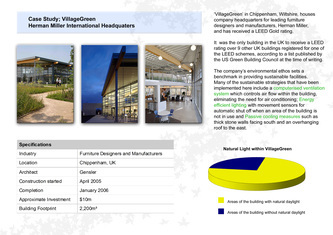 In 2003 there 60 LEED buildings were, on average, 25-30% more energy efficient. 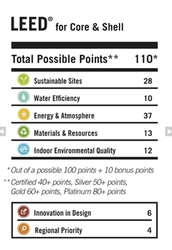 Sustainable Sites- LEED discourages development on areas which are previously undeveloped which reduces a buildings impact on nature and encourages regionally appropriate landscaping. 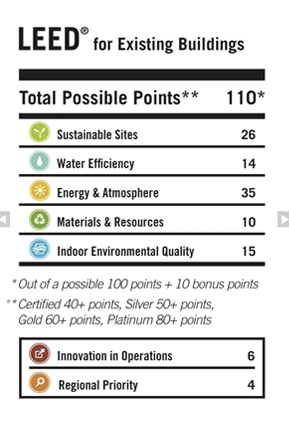 Water Efficiency- LEED encourages smarter use of water inside and out by using more efficient appliances and fittings. Energy and Atmosphere- According to the U.S department of energy buildings use 39% of all energy in, therefore LEED is working to reduce the amount of CO2 emissions. 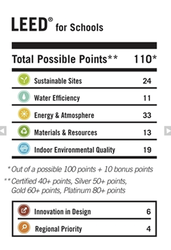 Indoor Environmental Quality- U.S Environmental Protection Agency estimates that Americans spend up to 90% of their day indoors where air quality can be poor, LEED promotes better ventilation. 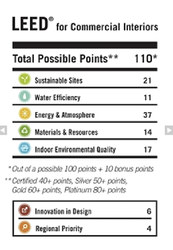 Locations and Linkages- Much of a buildings impact on the environment comes from where it's located and how it fits into the community, LEED encourages homes to be built near infrastructure. 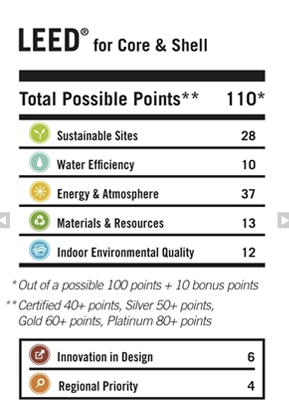 Awareness and Education- LEED recognises a building can only be truly called a 'green' building if its features are used to maximum effect, LEED encourages builders and designers to educate home buyers on making their new house green. Innovation and Design- Bonus points can be gained from LEED for projects that use new and innovative technology to improve the buildings performance. 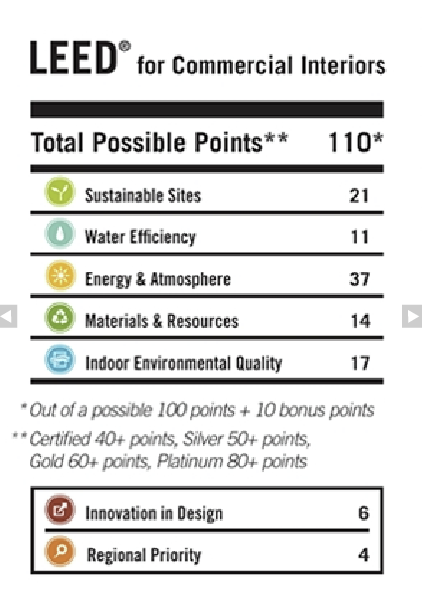 The LEED system can be applied to all types of building and follows the building throughout the whole process. 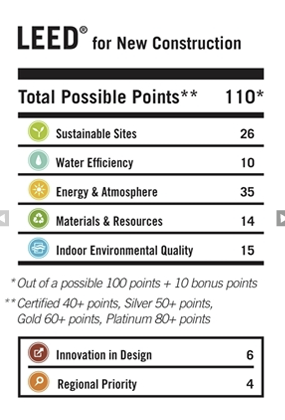 LEED points are awarded on a 100-point scale and credits are weighed to reflect their potential environmental impacts. 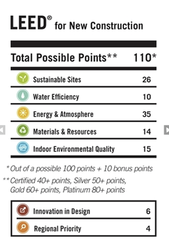 Below are LEED's detailed checklists of the requirements different types of buildings need to meet to be LEED classified, and how they score points in the points system.